Next week, on the first Tuesday in November, American voters will not only choose their representatives. In many states and cities, those casting ballots will also make decisions about water supply. On November 6, voters in San Francisco will decide whether they want the city to draw up a plan for draining Hetch Hetchy Reservoir to restore the valley and how to replace the water it stores and the energy it generates. Click image to enlarge. Next week, voters in San Francisco will decide whether the city should draw up plans to end a century-old dispute over the environmental cost of Hetch Hetchy Reservoir, which supplies 61 percent of the city’s drinking water. The cost of removing O’Shaughnessy Dam and replacing both its storage capacity and the energy it generates would cost between $US 3 billion and $US 10 billion, according to estimates by the state of California. Is Water On Your Ballot? 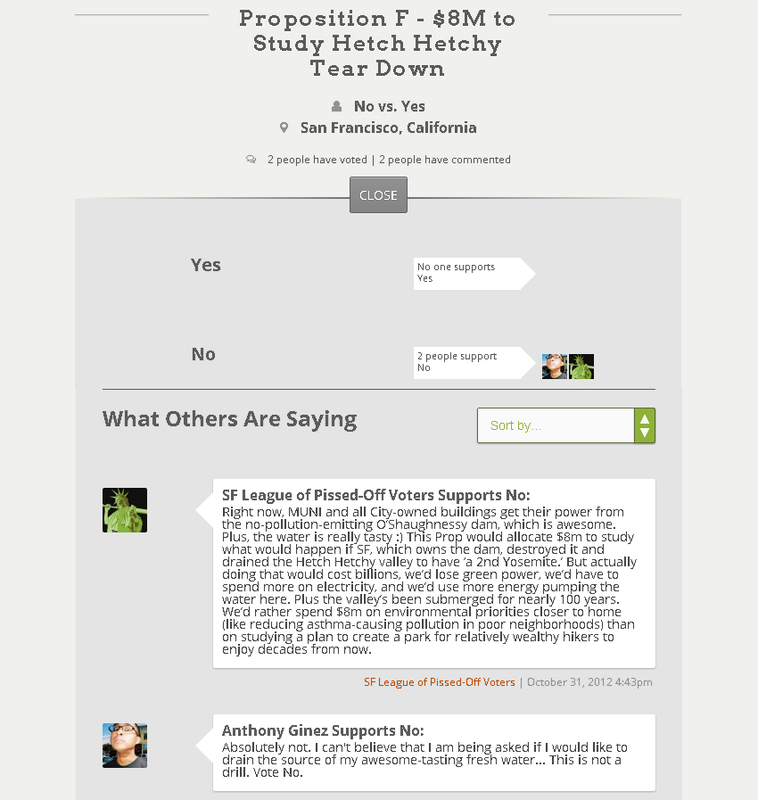 In the image above, two San Francisco voters relay how they are planning to vote on Proposition F, which will decide whether or not to begin the process of removing Hetch Hetchy Reservoir, source of 61 percent of the city’s drinking water. 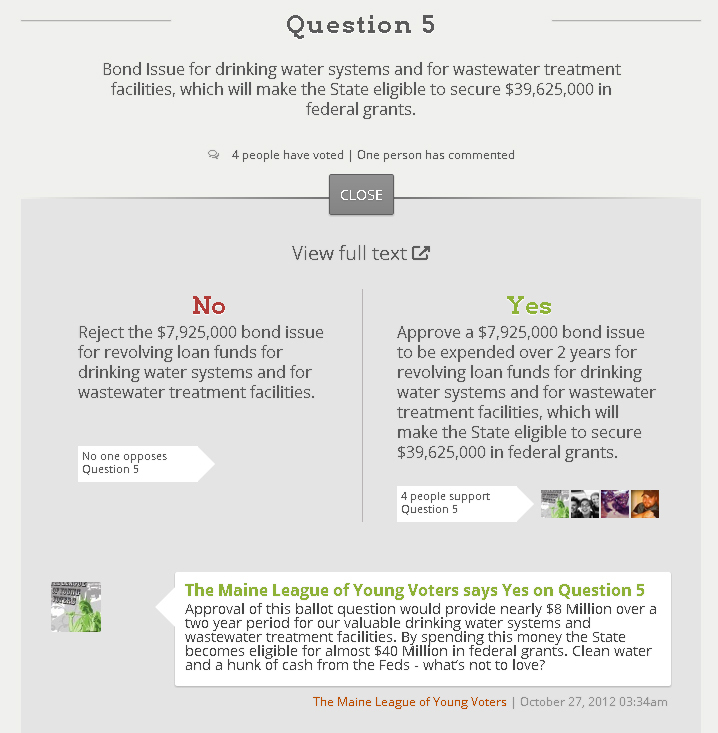 Want to know if there will be a water initiative on your ballot next week? Want to express your opinion, if there is? Go to TheBallot.org, and type in your address or allow the application to link to your Facebook account. The fate of Hetch Hetchy is by far the biggest water-related item on any U.S. ballot, but it is not the only one. More than half the states and many municipalities allow citizens to vote directly on matters of public policy. Ballot measures, initiatives, and referenda in this election cycle that touch on different water matters — disposal of wastewater from hydraulic fracturing, financing new infrastructure, desalination, and public control of water systems, to name a few — will be put before voters in Maine and Oklahoma, as well as those in big cities and small towns in California, Illinois, North Carolina, and Ohio. The billions of dollars of potential investment that are on the table next week are representative of the slow devolution of infrastructure spending from the federal level to states, counties, and municipal governments. Ever since a surge of spending in the 1970s following the Clean Water Act — which turned 40 last week — federal assistance has been chopped down and replaced with ratepayer dollars. Recently, Congress balked at establishing a national infrastructure bank and has cut the amount of money flowing into the federal funds for drinking water and wastewater projects. A 2010 survey from ITT, a manufacturing company based in White Plains, New York, found that 85 percent of voters agreed that federal, state, or local governments should invest in water system improvements, and 63 percent were willing to pay 11 percent more on their water bills to do so. Just last week, polling commissioned by global technology giant General Electric (GE) revealed that 84 percent of people surveyed thought that water resources should be a national priority. As this election shows, even though Congress may have lost its appetite for investment and the presidential candidates are politely looking away, a hunger for reliable water still exists among the electorate. Though water is clearly a primary concern in the daily lives of Americans, incumbent U.S. President Barack Obama and Republican nominee Mitt Romney have largely ignored the topic during the presidential campaign, as have the moderators at the three televised debates. The two candidates, however, did respond to questions about their water policies — as well as to questions about food, energy, climate change, and 10 other science-based categories — posed by the nonprofit organization ScienceDebate.org. In the failed jobs bill that Obama proposed to Congress in September 2011, the president included funds for a national infrastructure bank that would provide low-interest financing for water, energy, and transportation projects. Yet, in his responses to ScienceDebate.org, the president touted the investments that his administration has been able to make in water conservation and infrastructure, as well as improved access to drinking water for rural areas and poor communities along the U.S.-Mexico border. Romney, in accord with his general position on regulations, claimed in his response that federal water laws are “significantly out of date,” meaning that businesses and communities are shouldering the burden of “excessively costly and inflexible approaches.” Romney’s solution is to “modernize” federal water law, as he put it. “A combination of incentives, market-based programs, and cooperative conservation measures will improve the water quality of our lakes, rivers, streams, and coastal environments,” he wrote, echoing positions in the Republican platform, adopted at the party’s national convention in August. While the national candidates speak broadly — or not at all — about water-related programs and positions, the initiative process forces voters at the state and local levels to consider specific policies or projects and to decide whether or not they are willing to pay for them. In San Francisco, a rancorous debate about the city’s water supply and man’s relationship to the natural world is taking place. Nearly a century ago, engineers built O’Shaughnessy Dam on the Tuolumne River creating a reservoir in Yosemite National Park’s Hetch Hetchy Valley. Currently, Hetch Hetchy is one of six drinking water reservoirs that serve 2.6 million people in the Bay Area. Next week, voters will decide if the city should think about draining the reservoir to restore the valley. 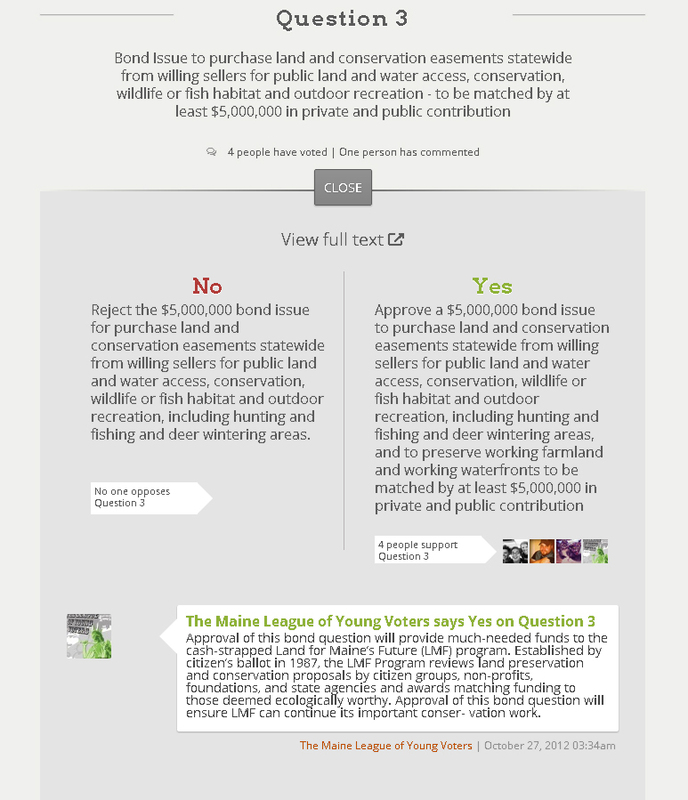 Voting yes on Proposition F does not mean that the dam will be removed, but rather it asks San Francisco voters if the city should spend $US 8 million to develop a plan to shut it down. If Proposition F passes, the plan would examine ways to replace lost storage capacity and power generation, and then be put to city voters in 2016, at the earliest. On the other hand, the Sacramento Bee, the capital city’s daily paper, claimed the push for a study to be “farsighted” and endorsed the measure. 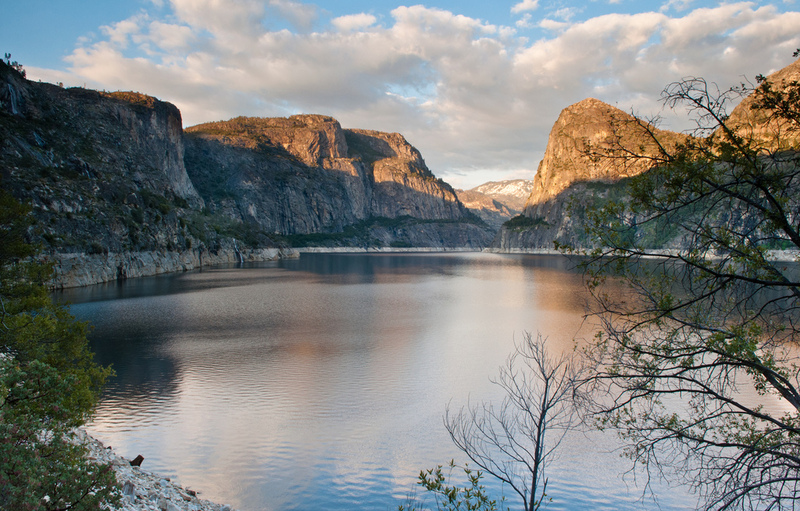 Restore Hetch Hetchy, the group leading the charge for removal and restoration, argues that a broader constituency is at play. “This belongs to the American people. And what we can do — what San Francisco can be leaders in — is draining this and bringing this incredible place back to life,” Mike Marshall, director of Restore Hetch Hetchy, told San Francisco radio station KQED. Meanwhile, just down the California coast, residents of Santa Cruz will also have a hand in shaping decisions about the future of their water supply. This election cycle, Santa Cruz has a ballot measure that would amend the city charter to let voters approve or reject any future plans for a desalination plant. Santa Cruz is following in the steps of in Marin County, where, in 2010, voters approved a measure requiring approval public vote before the local water district can construct any desalination plant. Voters in Wichita, Kansas, will decide whether the city should add fluoride to its water supply. Wichita is one of several large U.S. cities to take up the fluoridation debate this year. The others, though, have resolved the matter via their city councils. In Aspen, Colorado, the question is whether or not the city should continue to pursue a controversial hydroelectric project. In Wauconda, Illinois, voters will decide on a $US 41 million bond measure to extend and improve the pipeline system to bring in water from Lake Michigan. Residents of Mansfield, Ohio, will consider whether to block the development of wells that store wastewater from hydraulic fracturing. A Texas company is planning two such injection wells within city limits, according to the Cleveland Plain Dealer. And in Ashville, North Carolina, the November election will mark a milestone in a year-long battle between the state and the city over the city’s water utility. Asheville residents will vote on a referendum asking whether the city should sell or lease its water treatment and distribution system. The question is being put to voters, because a study committee, convened by the state’s General Assembly, recommended in April that control of the Asheville water system be transferred to a regional sewage district. The referendum is non-binding, and the state can override a vote against the transfer. In fact, the study committee recommended that the General Assembly merge the two systems during the 2013 session. Voters in Oklahoma are being asked to approve the creation of a Water Infrastructure Credit Enhancement Reserve Fund, which would authorize up to $US 300 million in general obligation bonds for drinking water and wastewater infrastructure, expanding a program initiated by the state legislature in the 1980s. The fund allows communities to piggyback on the program’s AAA credit rating. The bonds would be sold only if a community defaults on a loan, according to the Tulsa World. The fund — one of eight priority recommendations in the state’s water plan — has broad support, including from the Oklahoma Farm Bureau, the State Chamber of Oklahoma, and the Oklahoma Rural Water Association. A smaller bond program is on the table in Maine. The state wants to issue $US 7.9 million in bonds for drinking water and wastewater, which would make it eligible for nearly $US 40 million in federal grants. 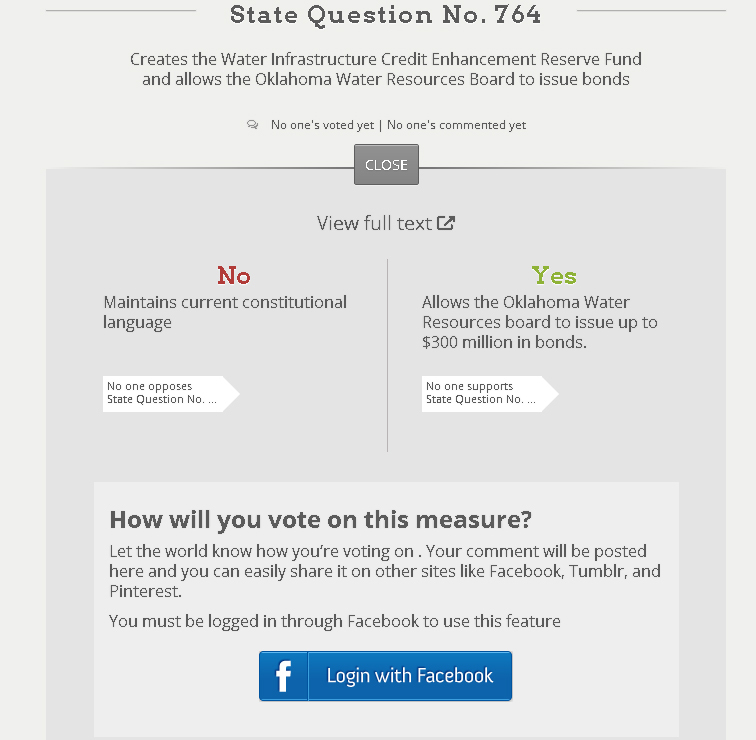 Want to see more about the water-related ballot initiatives in Maine and Oklahoma? Click the images above to enlarge. Some measures did not have enough support to make it on this year’s ballot. Voters in California will not see an $US 11 billion bond to finance water infrastructure. The state legislature postponed the bond until 2014 because of other measures, which, in sum, would have presented a potentially repellant price tag. And in Colorado, supporters of two initiatives that would have rewritten state water law could not gather enough signatures to meet a filing deadline. Senator Obama's comments heat up water wars in Southern U.S.